The Umbrella Ship is an interactive art-machine reminiscent childhood fantasy. The Umbrella Ship is modeled after a Land Sail: a wheeled vehicle propelled by a large wind sail and rowable chuck-oars. 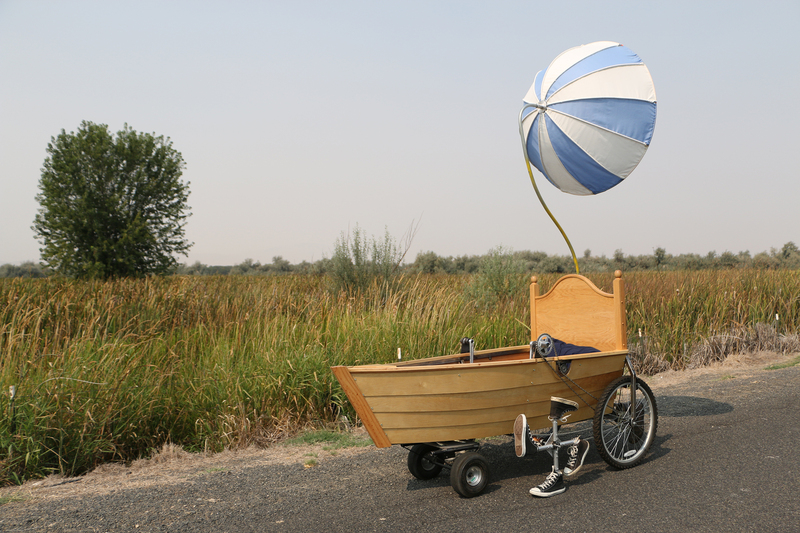 The physical realization of a sailboat gliding across the land begged for additional allusions reminiscent of child-like imagination and so the vehicle transitions from bed to ship to bicycle to evoke a child's dream-vessel. The foundation of The Umbrella Ship is constructed from bicycles and propelled by a large umbrella that can be steered to catch the wind. The back and interior of the ship is a child's bed complete with headboard, sculpted mattress, pillows and blanket. The sides and the front are in the shape of a ship with functioning walking-boot-oars. A single passenger climbs in the bed-boat and is able to sail The Umbrella Ship across the land. The Umbrellaship was made possible in part by funding from the Grants for Artist Projects by Artist Trust, Dr. Charles Pezeshki's 2015 Systems Design class at WSU and David Lake.